Every year, the Student Fee Recommendation Committee convenes to decide how to allocate the student fees paid alongside tuition. The SFRC is made up of eight students who apply at the beginning of the academic year. They are each assigned organizations that have applied to receive more money from student fees and act as liaisons for them. For four organizations, this will be their first year asking for money from student fees. Alumni Relations is asking for $28,000. According to their application, they would like to grow the Cat2Cat program, continue funding events for students, continue their mentorship program and add a new student position on staff. Alumni Relations has been involved with the Tradition Keepers program, which collects 50 WSU traditions into a program for students to complete. Along with those events, Alumni Relations also assists with Grad Finale, giving out the license plate frames to all graduates. Ogden Peak Communications is the public relations firm housed on campus in conjunction with the communications department. OPC is asking for $1,720. This will fund website hosting, client deliverables, awards and recognitions, contest entries and networking events. On both state and national levels, OPC has been recognized and awarded for their work. Many students work with local businesses and nonprofits in helping develop visibility for these companies. Additionally, Peer Mentoring has been growing steadily. In the past, it has been funded by the Center for Multicultural Excellence. The growth of the program requires additional funds, which have been proposed at $15,400. This will go to student staff wages and conference attendance. With the growth of student participation in the Peer Mentoring program, more mentors need to be hired so that mentees don’t end up on a long waitlist. In addition, the conferences offer more training opportunities for the mentors. Finally, the Creative Writing program is seeking $9,000 to grow its Visiting Writer Series. Currently, the program has been bringing one nationally-acclaimed writer to campus each semester, and they would like to increase that number to four or five writers. Although there are some funds allowing for the one author to come per semester, growth in the Creative Writing Program and in the Visiting Writers Program have encouraged the programs to seek out new funds to allow more students greater opportunities. Along with the four new organizations asking for money, there are 22 entities asking for an increase in their budget, and 12 entities not asking for an increase. 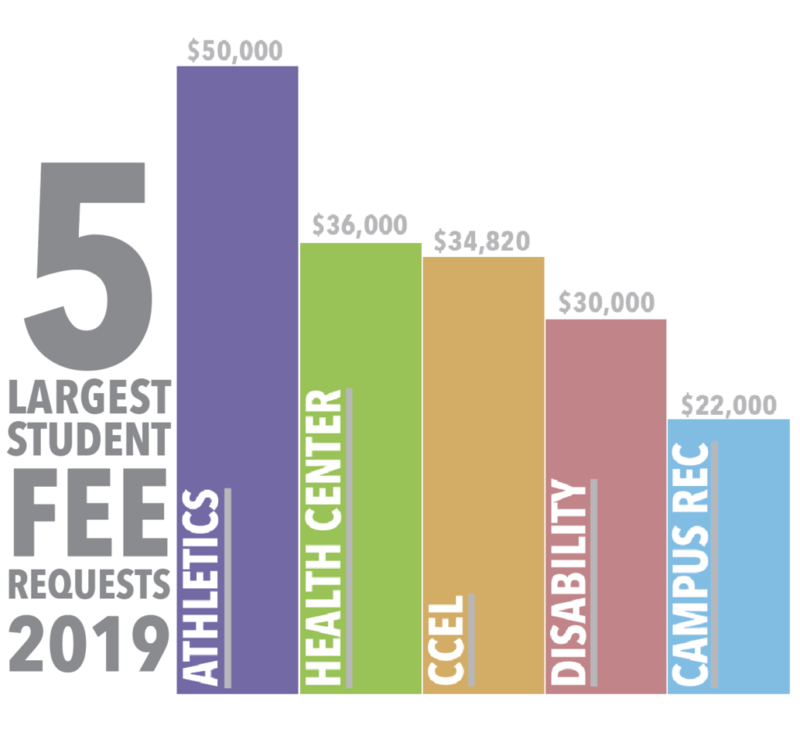 Of the 22, the five largest monetary asks come from Athletics, the Student Health Center, Community Center for Engaged Learning, Disability Services and Campus Recreation. Athletics is asking for a $50,000 increase. According to the application, the increase would go toward the Spirit Squad. The funds would pay for their travel, gear and a new assistant position. Overall, this is a 2 percent increase from the 18-19 fiscal year. The Student Health Center would like an addition of a Student Wellness Programming Assistant. This would require a $36,000 increase, an overall 4 percent bump. In 2017, the Alcohol and Substance Abuse Prevention was handed over to the Student Health Center. The Student Wellness Coordinator already had 44 referrals and the program is reaching a 200 percent increase. All of these students have been handled by a single coordinator. With a $34,820 increase, CCEL hopes to make their Data Analyst position permanent. This is part of the Research Extension created five years ago to help give students applied experience, along with assisting the needs of the community. The Research Extension provides one of the few applied research opportunities on campus. Disability Services works with students with any type of registered disability. They have requested a $30,000 increase, paying for deaf and hard-of-hearing services, such as ASL Interpreting and real-time captioning for use in the classroom. Campus Recreation provides work for 100 hourly employees. They have requested $22,000 to assist with the increase in minimum wage for hourly student positions. Several of these positions have been capped, or did not increase over time, to keep the amount of money they would need to a limited amount. The SFRC begins their debate on who will be allotted what funds on Feb. 8 and Feb. 15. The committee will hold their celebration on Feb. 22. To see all of the Student Fee Request applications, click on the link below.